The Weeknd plays with Rae Sremmurd, Belly, and 6lack this Friday at Boardwalk Hall in Atlantic City. Mike Hadreas might not yet be a household name, but he’s quickly amassed a cult following as an indie darling under the name Perfume Genius. Over the course of four albums, Hadreas has explored and celebrated his queerness through magnificent pop, increasingly wandering out of his shell and asserting his very identity as a radical statement of intent. On his latest, “No Shape,” Perfume Genius is drunk in love, and he’s never sounded happier or more sure of himself because of it. 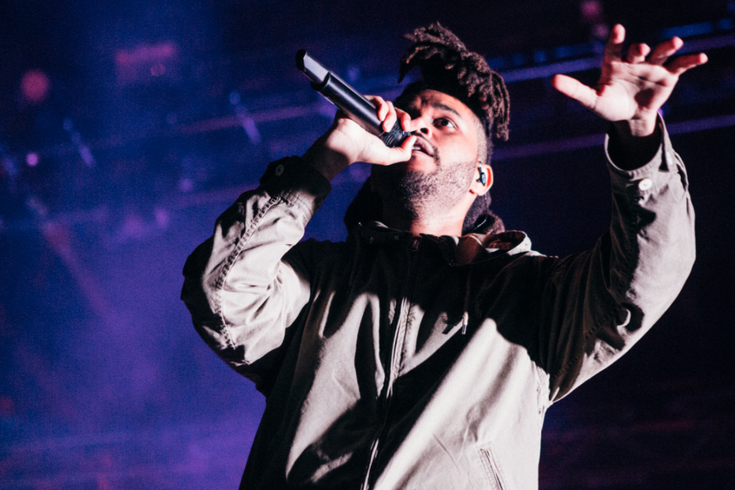 Once relegated in the margins of the pop charts, Toronto R&B singer The Weeknd has spent the last couple years catapulting himself into superstar status. The sultry and brooding crooner flipped his run as a Drake songwriter into his own spotlight: headlining festivals, packing stadiums, and collaborating with icons like Daft Punk. On Friday, he brings the show to the Boardwalk alongside some of hip-hop and R&B's buzziest supporters. It seems like just yesterday that the prolific singer-songwriter Ty Segall was in town playing at the same venue he's returning to this weekend, but then again, he's also the type to release an album-a-year (or more) and never look back. So it's fitting that Segall stays on the road and rarely takes breaks. On his latest self-titled album, the ninth in his catalog, Segall remains intimate but flips his sound upside down, trading the garage aesthetic for gratifyingly poppier territory. Usually, artists this busy fail to surprise, but Segall revels in the unexpected, which keeps fans perpetually coming back for more. The latest headlines surrounding the Massachusetts grunge rockers Godsmack have offered some hope for nostalgic fans, hinting that next year they’ll celebrate their 20th anniversary by playing their debut album in its entirety for a 2018 tour. But while that prospect of a fan-service tour is still floating around, the group stays busy playing their greatest hits at shows and mini-festivals like this weekend’s MMR*BQ throwdown across the river in Camden, which will also corral adjacent acts like Live, Bush, and more. The New England songwriter Doug Tuttle makes jangly folk with the best of them. His sound can be serene and psychedelic at once, and there’s always a sense of spaced-out spacing in his tracks: his voice sounds far away, the guitar seems like it’s right in your face, the drums are off to the side. In that way, Tuttle’s music isn’t just nostalgic, it’s like time traveling directly into the studio sessions of one of your parent’s favorite bands. The English singer and guitarist Lewis Watson doesn’t pretend he’s something he’s not. Watson’s music is neither heady nor hard-to-get, so you can gather the gist of a song on a single play through. But that instant “have I heard this before?” feeling in your gut doesn’t always leave a bad taste. In other words, the young musician has an innate familiarity, like one of the surprisingly talented acts you might catch at a coffee shop's open mic night. Watson’s soft, poppy rock is in full force on his sophomore album, “Midnight,” which he’ll bring out this weekend at World Cafe Live.